Conservation Kids NZ is a popular and well established club and charitable trust based in Picton, New Zealand. Their passionate team of volunteers host a variety of fun events focused on conservation and wildlife education for kids. By uniting NZ youth at these events, they hope to inspire them to become more involved and to discover and achieve their very own conservation goals and dreams. 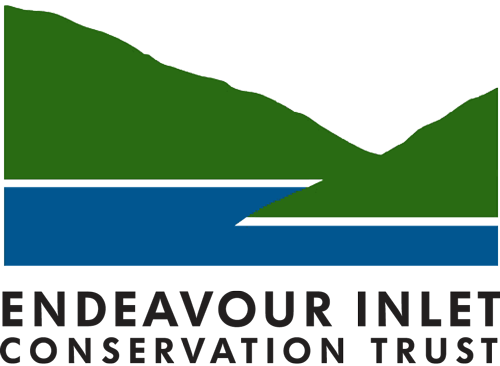 We are a community-driven initiative creating and supporting conservation projects in the hills surrounding Endeavour Inlet, in the Queen Charlotte Sound. Our aims through the EICT are to protect and enhance the natural eco-systems and heritage values of Endeavour Inlet and the surrounding areas within the Marlborough Sounds for the benefit of the community, visitors and the public. An environmental hub that unites, inspires and assists Marlborough youth, families and conservation groups to achieve their environmental goals. Opening Hours: Everyday 9.00 am - 3.00 pm. Guardians envisage a future with an Integrated Management System involving Marlborough District Council, Residents Associations and Sounds user groups whereby residents have a greater opportunity to participate in decision – making regarding the Sounds. We see environmental issues and problems as management issues best decided upon by those directly affected. Guardians of the Sounds will remain an independent lobby group, as it has always been. Kaipupu Point Wildlife Sanctuary is located on an outcrop of land between Picton Harbour and Shakespeare Bay. The sanctuary is a community conservation project lead by a team of dedicated volunteers. Their aim is to created a mainland island sanctuary that protects and enhances our unique New Zealand wildlife.The area is separated from the mainland by a predator proof fence, the only access is by boat. Information Centre open Monday, Tuesday, Thursday & Friday 9.00am – 3.00pm. In 2009 the MSWRT took over governance of the ongoing rehabilitation and conservation projects at Lochmara Lodge in the Queen Charlotte Sounds. The Trust focuses on long term projects for education, recovery, protection and enhancement of the native Marlborough Sounds through community partnership. Picton Air Quality is a community group advocating for effective local air quality management. We are a community group with the aim of controlling pests in Picton/Waikawa and the surrounding hills to restore our native bird life and support the work at Kaipupu Point. The Society is committed to using humane and environmentally sensitive methods of pest control focusing initially on the Snout and Victoria Domain. Mission - To free Picton of plastic bags. Reducing waster by supporting re-usable biodegradable shopping baf alternatives in the beautiful town of Picton and beyond. The project has a long term goal of replanting native trees to the Marlborough Sounds. Our forefathers removed 1 million cubic feet of podocarps from the area and now is the right time to replant the sounds for a sustainable future. This is a practical project which will enable us to offer Enviromental Education to our younger generation by involving them in the removal of pest species and restoration of local native forests.